Asking a girl to be your girlfriend might have you hyperventilating. Take a deep breath. Instead of freaking out, learn how to ask a girl to be your girlfriend by finding the perfect spot, words and time. You can also choose to go the cute route and really have her falling for you. According to Psychology Today, one of the tips for preparing for an anxiety-inducing conversation is to consider how the other person probably feels. Consider her feelings while planning what you want to say. Nervousness might make you fumble with your words and accidentally avoid asking the question, "Will you be my girlfriend?" Don't be vague; you don't want to walk away from the conversation wondering if she's your girlfriend or not. "You're the only girl I want. Will you please be my girlfriend?" "I like you very much, and I'd like you to be my girlfriend. What do you say?" "I know you, and I would make a great couple. Will you be my girlfriend?" "You will make me the happiest person in the world if you say yes to being my girlfriend. What do you think?" "I think it's time we take our friendship to the next level. Will you be my girlfriend?" The key to asking her is to make sure and ask the actual question rather than beating around the bush. This way, there are no misunderstandings at the conclusion of the conversation. Keep in mind, with such a direct question, the girl may not be ready to give an answer right away and may need time to think it over. If this is the case, try to be patient while suggesting a specific day and time when you can check back in with her to get her answer. Appropriate wording for this situation might be, "I understand you want to think it over. How about we talk about this again on Monday, and you can give me your answer then?" I only want to date you, will you be my gf? I'm ready to be your boyfriend, are you ready to be my girlfriend? Can we make it official and be boyfriend/girlfriend? Would you do me the honor of being my girlfriend? I'm in this for the long-term, wanna be my girlfriend? Don't allow your desire for a girlfriend to turn into a weird game of telephone. Don't send your friend to ask on your behalf. Setting the stage for asking a girl to be your girlfriend should revolve around what makes the both of you the most comfortable. Be sure to choose a location where the two of you will be able to focus on one another. A crowded party where you have to yell over other people is not an ideal setting, for example. A special spot that means something to the two of you (such as where you first met or a place she loves) this makes an ideal spot for asking because it adds romance and helps her understand how much time you spent thinking this over. She'll understand this was not a spur-of-the-moment decision you may later regret. It's best to do this without an audience; don't allow friends or bystanders to turn the situation into a spectacle or make her feel pressured. Before asking a girl to be your girlfriend, it's important to look at your relationship and decide if you're ready for that commitment. 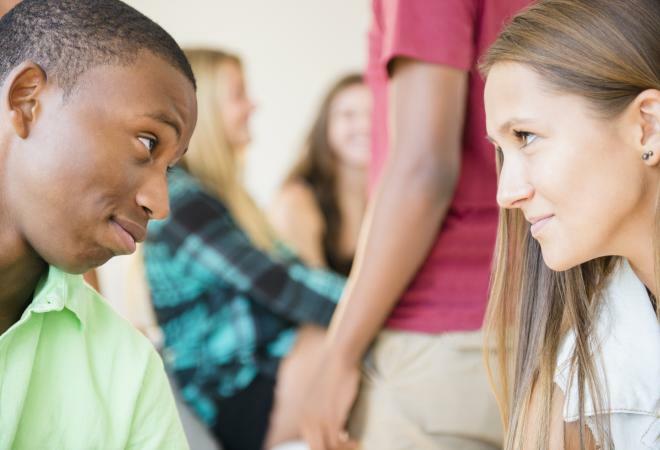 Most teens don't get into official romantic relationships until around age 15. What the terms "boyfriend" and "girlfriend" mean to each person are different, but if you've been talking for two to three weeks, have been on four or five dates, and feel like you don't want to date other people you could take your relationship to official status. Try to select a time when there aren't time constraints, so the conversation isn't rushed. For example, asking while passing through the halls on the way to the next class will probably make her feel like she's under pressure to decide and her knee-jerk reaction may be to say no. If you take some time beforehand to plan out the moment of asking her to be your girlfriend, there are plenty of cute ways to ask a girl to be your girlfriend. Be advised, if the girl isn't the type of person who would enjoy something cute, then using a cute way to ask her out may send the message you don't truly know her or might make her uncomfortable. Write out your question in chalk, either in her driveway or along her walking path to school. Be sure to sign it. Present her with a cake or cookie with icing that spells out the question for you. Give her a heart (jewelry, or drawn, or folded paper) and say, "Now that I've given you my heart, will you be my girlfriend?" LifeDaily suggests buying a talking teddy bear that allows you to record your voice asking her out and presenting it as a gift. It's important to go into the moment confident and ready. On the other hand, don't rehearse so much beforehand that the moment becomes a monolog where you don't listen to her response. Whether you plan an elaborate moment or keep it low key, make sure your intentions are clear, and you try to help her feel at ease. The less awkward and anxious you feel the more comfortable the moment will be.